Buck up Aibo. It’s not just you. Kuri was once described to me as an intergalactic space penguin. Accurate. But around this time last year, I had an inkling of hope that this future was at least on the horizon. Mayfield Robotics’s Kuri Robot was lovable, functional, and buzzworthy with its cute mannerisms and deft behavioral touches. Like, it’d wiggle and waggle as it maneuvered around a room. And unlike some other home robots, it wasn’t single function. You could use it as a videographer or security camera feed, have it play music and audiobooks, and it had some basic Alexa-likefunctions. It had a strong second-year showing at CES 2018, and when I talked to CEO Mike Beebe, he said Kuri was on track and on time for shipments. Jibo, another Pixar-esque social robot, was also making moves. Not only did it grace the cover of Time as one of the top 25 inventions of 2017, but it overcame a bunch of delays from its Indiegogo launch and was finally on its way into homes. The little dude could answer questions like Alexa, but also could recognize up to 15 people, greet them by name, and oh, was pretty great at twerking. 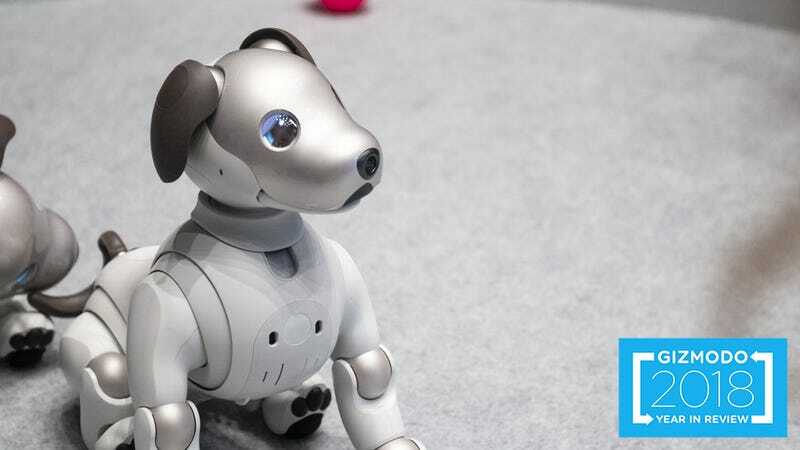 And, Aibo—Sony’s robotic pup—rose from the dead in 2017, just in time to make a grand entrance at CES 2018. It had sparkly blue eyes, a more realistic look, and the ability to memorize faces. The first generation Aibo had a dedicated fanbase in Japan—so much so that 114 were given a traditional Buddhist funeral once Sony discontinued the repairs for the robot dogs in 2014. And then the rest of 2018 happened. Despite being on track in January with shipments, by the end of August, Mayfield Robotics announced it was shuttering operations and canceling Kuri. Parent company Bosch just couldn’t find investors to go in on Kuri’s long-term development. Then in late November, Jibo—which already had a history of delayed shipments—sold off its IP assets in what is basically a death knell for the bot. That said, signs of trouble were evident as far back as July, when a Boston Globe reporter visited Jibo’s office to find it empty and full of packing supplies. Kuri and Jibo aren’t the only robots that had a dismal year. Drone startup Airware blew through $118 million in funding after it fumbled manufacturing its own hardware. Even more industrial or conceptual robots have had a rough go of it. Alphabet just announced it’s going to shut down its Schaft robotics team. Rethink Robotics, maker of the Baxter and Sawyer robots that nabbed headlines in 2012 about whether they could transform manufacturing, also shut down after customers noted they weren’t up to task in industrial settings. The Anki Vector is adorable...but more toy than bot. The Anki Vector was a dark horse late this year. Tiny, adorable, and affordably priced (for a robot) at $250, the Vector is designed to be a cheery, helpful robot sidekick. It’s a palm-sized WALL-E that can answer voice prompts. It’s also more of a toy than an actual home robot. There’s no real reason to buy one...because it can’t really do anything aside from a neat bag of party tricks like giving you fist bumps and playing Black Jack. Beyond a few days of heartwarming novelty, most consumer bots like the Vector ultimately leave you feeling strangely empty. The only home bots that consumers as a whole could get behind this year were robot vacuums. These single-purpose bots ping-pong across homes sucking up dirt and dust, though many do a questionable job of it and by and large, they’re limited to dry messes. (Mopping robots are for the most part, completely useless.) And yet, both Neato Robotics and iRobot, maker of the famous Roombas, released high-end updates to their product lines. The Neato Botvac D7 Connected can now clean individual zones and map multiple floors, while the Roomba i7+ can automatically recognize rooms and empty its own dustbin. Both are expensive at $800 and $950, respectively. But they have cheaper cousins who can do a lot of the same things for as little as $300-$400. You can find even more budget robot vacuums on sale for less than $200, and regardless of how well they clean, that’s cheap enough for people who really hate vacuuming to give it a go. If you shell out $900 for a Jibo and it can’t outperform a $50 Alexa, you’re going to be pissed. It’s not just the price either. Even if robots like Kuri, Jibo, and Aibo are adorable, they carry a bit of Uncanny Valley eeriness in their DNA. It takes a little getting used to the idea of Jibo’s head following you around a room. You don’t know how a real cat or dog might react to a Roomba, but you definitely can’t predict how it’ll interact with Kuri. But more importantly, robot vacuums succeed because there’s no threat of mistaking them for anything other than a service bot. Yes, we personify them and give them names. But they don’t have eyes. They don’t speak or make piddling attempts at a sense of humor. Robot vacuums clean our messes. That’s it. We can choose to make friends of them, but they’re not asking to make friends of us—and then doing a poor job of it.